With your Linkin.bio page helping you drive more sales and traffic from your Instagram to your product pages, it’s important to monitor the clicks and visits your Linkin.bio page generates over time. That way you can see if your audience is engaging with your posts and interested in learning more about the products and content you host on your feed. 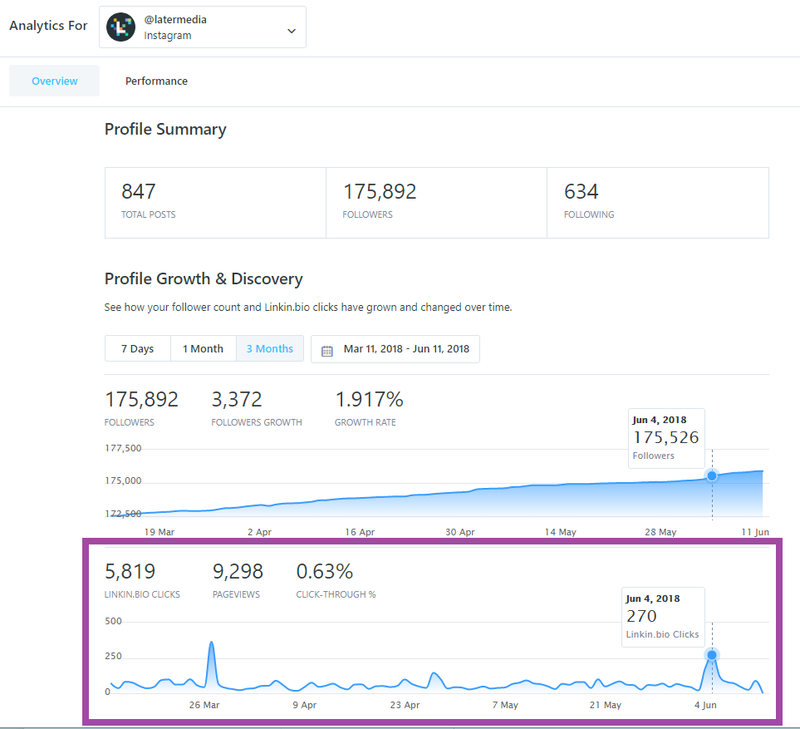 Start by tracking the total number of visits, clicks, and average click per post coming from your Linkin.bio page with your Pro Instagram Analytics. Then use Google Analytics to track the revenue and sales coming right from your Instagram! Go to your Analytics Dashboard from Later on the web and select the Instagram account you'd like to view analytics for. 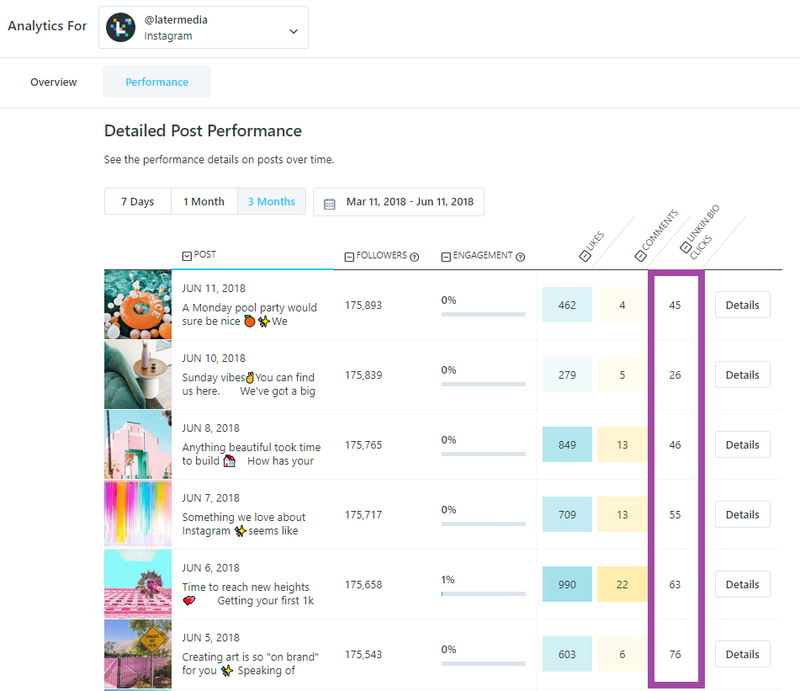 To take a deep dive into which of your posts are performing the best, toggle to the Performance tab of your Pro Analytics. 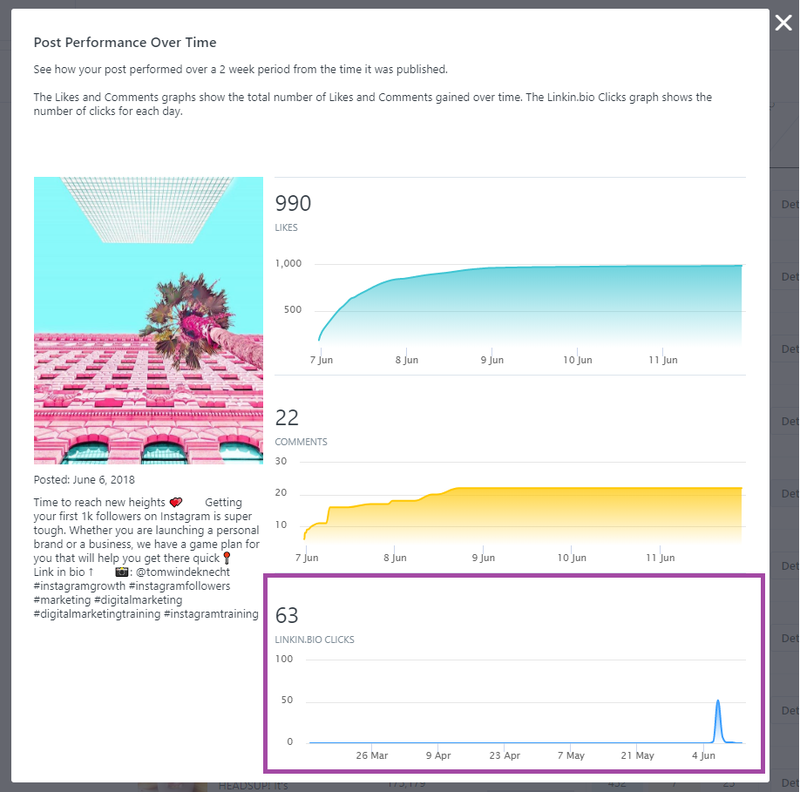 Track the total number of clicks each of your posts get on your Post Performance page. Important: If you have multiple links set up for one linkin.bio post, this will display the total number of clicks those links have received! Tip: Look at the post with the most clicks and see if there’s a correlation between the number of clicks and the product/content you shared or the type of caption you used. This information should give you some guidance on how to optimize your future Instagram posts to get the most engagement. With Google Analytics you can also track your e-commerce sales to see exactly how much money you’ve made from each Instagram post. To help you do this, Later will automatically generate a unique UTM Campaign parameter to track your clicks, sales and conversion rates coming from your Linkin.bio page. Here's how your can find the total number of sales and revenue coming from your Instagram account. First head over to your Google Analytics report and select a date range. Choose Campaign as a secondary dimension to see the report based on campaign and then you'll be able to see all the traffic for your unique Linkinbio UTM campaign.